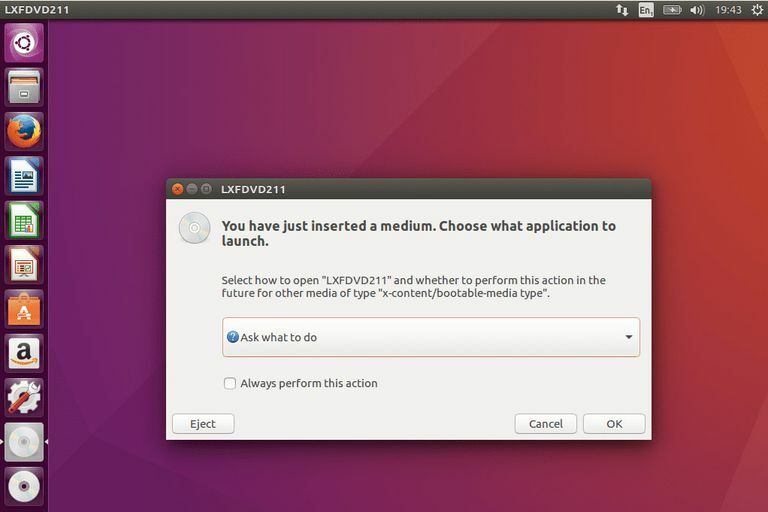 In this guide, you will be shown how to mount a DVD or CD using Ubuntu Linux. The guide shows multiple methods in case one way doesn't work for you. In most cases when you insert a DVD you just have to be a little bit patient whilst the DVD loads. You will then see a screen similar to the one shown in this guide. The messages you will receive will vary depending on the type of media you have inserted. For example, if you have inserted a DVD from the front of a magazine, which contains software designed to run automatically, you will see a message saying that the software wants to run. You can then choose whether to run that software or not. If you insert a blank DVD you will be asked what you want to do with the DVD such as create an audio DVD. If you insert an audio CD you will be asked whether you want to import the music into your audio player such as Rhythmbox. If you insert a DVD you will be asked whether you want to play the DVD in Totem. You may wonder what the point is to a guide showing how to do something so simple, but sometimes things don't go according to plan and you will want to use the command line to mount the DVD. You can see if a DVD has mounted by using the file manager. To open the file manager click on the filing cabinet icon on the Ubuntu Launcher which is usually the 2nd option down. If the DVD is mounted it will appear as a DVD icon at the bottom of the Ubuntu Launcher. You can open the DVD in the file manager by clicking on the DVD icon as well. If you are lucky you will see the DVD in the list on the left side of the file manager screen. You can generally double click on the DVD's name (with a DVD symbol) and the files that are on the DVD will appear in the right panel. If the DVD hasn't automatically mounted for some reason you can try right-clicking on the DVD and choosing the mount option from the context menu. You can eject the DVD by right-clicking on the DVD and choosing the Eject option or by clicking on the eject symbol next to the DVD. A DVD drive is a device. Devices in Linux are treated in the same way as any other object and therefore they are listed as files. Now use the ls command and the less command to get a listing. What this tells us is that both CD-ROM and DVD link to sr0 so you can mount either a DVD or cd using the same command. To mount a DVD or CD you need to use the mount command. First of all, you need somewhere to mount the DVD to. The DVD will be mounted and you can navigate to the media/mydvd folder and perform a directory listing within the terminal window. In most cases, you will use the graphical tools to navigate and play the contents of DVDs but if you find yourself on a computer without a graphical display then you now know how to manually mount a DVD.